It probably wasn’t the best idea ever to use @blueeyesburn–a creative non sequitur–rather than simple and explicit Twitter handle. I didn’t even check to see if “abbyandeva” was available. Ya know, my blog title… That would have made sense, right? I’m sure this is the first broken rule of many when it comes to social media, marketing, and self-promotion. I like to keep people guessing. Having spent my college career devoted to literature and language, I care about symbolism. Symbols are significantly more concise than explaining everything all the effing time. (which is what I do on my blog…but that’s beside the point…) And blue eyes are symbolic of that awful, inflexible beauty paradigm women constantly battle: looking like models and–in the bigger, historical picture–simply being white. Yes, I like my eyes and they are generally my most complimented feature, but other than being white, I am not representative of that model at all. Nor is Eva. 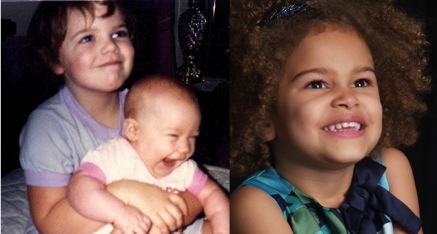 I have blue eyes, but my gorgeous biracial daughter does not. Her eyes are a glittering mix of green and brown and they are set into a face that could steal your heart. She is stunning. People literally stop in their tracks when they see her. All the time. Especially at the mall. She doesn’t fully comprehend the significance of that yet. What she does know is that she doesn’t look like me in some ways and it bothers her. I am covered in freckles. She has one, solitary freckle on the little toe of her left foot. We talk about that freckle. That her one is just as good as mommy’s many. She knows my hair is nearly black and straight, we say hers is made of golden curls (light brown with beautiful, natural flaxen blonde highlights). Gold is special. I want Eva to know she is special. I know I can teach her that by being comfortable and proud of who I am but I fear our society isn’t as open-minded and culturally aware as we want to believe it is. Yes, now there are so many more accepted interracial families than there were ten years ago. There are many beautiful, successful celebrities that are of mixed backgrounds. But does anyone remember the 2008 elections? (I promise this is not about politics! Don’t navigate away yet!) It didn’t matter that Barack Obama was raised by his white mother and grandparents. 50% African genes meant more than his 50% Caucasian genes. He is the first “black” president in the eyes of the public. Now, please don’t take that the wrong way. I would NEVER want to detract from how meaningful and uplifting his success is and SHOULD be to the African American community. Believe me, I held my 10 month old baby girl and bawled my eyes out the whole way through his inauguration. It’s a huge step in the right direction. But for all intents and purposes, his mixed race status was set aside because it was easier to check the “black” box than actually be progressive enough to discuss race as more than a black and white issue. But how do we as parents make it a non-issue? Aren’t humans programmed to sort and define and categorize? We wouldn’t have scientists if there wasn’t something driving us to understand. I’m just saying. And wondering. I’m a white momma to a mixed daughter and sometimes I wonder if I am giving her everything she needs to succeed and have a healthy self-esteem. The good news is if you look past the freckles and the hair color, we DO look alike! Holy genetics, y’all! That’s my face! And anyone can tell you that Eva and I share facial expressions down to the tiniest muscle contraction. Total mini-me. I would love, love, love to hear from other interracial families (especially with older, more cognizant kids). How do you approach the “why do we look different?” question? What makes it easier? What makes it more difficult? I’d love to hear from anyone about this, actually. And while I have your attention: thank you for reading. It means a lot to me.